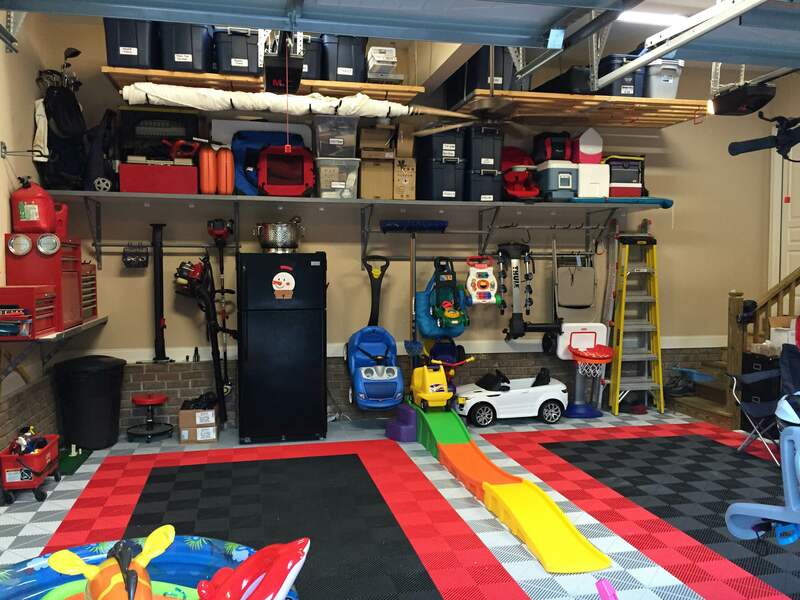 This garage had great storage and was pretty organized to begin with; until we took it all down and realized most like items were not together. It was challenging for the homeowners to find what they wanted without searching through each bin. In the back of the photo, you can see the treadmill was in the way of the shelf. The toolbox had items placed on top of it making it difficult to lift the lid without having to remove things. The client wanted solid, sturdy bins, and a uniform look – so he purchased the blue bins you see in the foreground. Notice how the horizontal bars no longer look cluttered with random items hanging on them. The blue bins give a clean look. We filled each bin with like items and then labeled with its contents. The treadmill was moved to the right side of the garage and the children’s mobile play toys were hung up on brackets to create floor space. Even with all the children’s play things in the garage, it’s still possible to park two vehicles.